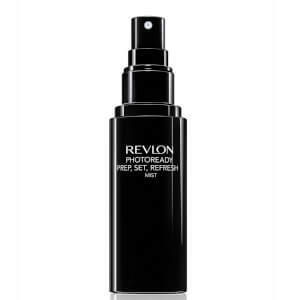 Create a glowing complexion with Revlon PhotoReady Prime, Set, Refresh Mist, a triple threat formula for flawless skin. Working as a primer, a makeup setting spray and an instant refreshing mist, the ultra-light formula works to replenish moisture deep below the skin surface for a clearer and brighter appearance. Using High Definition Filter Technology to diffuse light and blur the look of pores and imperfections, the spray creates an invisible veil to help lock in makeup all day. Expect comfortable, hydrated and radiant-looking skin. Hold 8-10" away from the face and close eyes. Spray in circular motion even around the face. Aqua/Water/Eau, Glycerin, Butylene Glycol, Biosaccharide Gum-4, Citric Acid, Citrullus Lanatus (Watermelon) Fruit Extract, EDTA, Hamamelis Virginiana (Witch Hazel) Water, Lens Esculenta (Lentil) Fruit Extract, Magnesium Sulfate, Maris Sal ((Sea Salt) Sel Marin), Polysorbate 20, Pyrus Malus (Apple) Fruit Extract, Sodium Lactate, Sodium PCA, Sodium Phosphate, Tetrasodium EDTA, Parfum (Fragrance), Hydroxycitronellal, 1,2-Hexanediol, Phenoxyethanol, Sodium Benzoate.